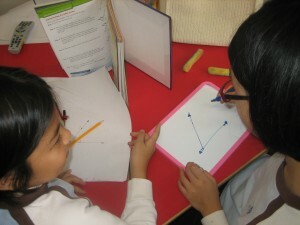 I have always found my mini whiteboards to be of great value in the classroom, especially when I happen to be in a school without tools such as IWBs or even a sufficient amount of classroom computers. One of the main reasons I love these boards is because they are an excellent type of formative assessment. Whether each individual child has one or pairs of students work together to share their prior knowledge with the class, the amount of information you can gain about where your students are is endless! Another great advantage of these little boards is their assistance during one-on-one conferencing. They are so easy to just grab and brainstorm ideas, relevant vocabulary for a piece of writing, examples, etc. Once your students know these tools are available in the classroom and are easy to use, you will see them utilizing them for their own purposes as well. Just this past week I had students using them for support during a Mathletics task and another pair of students trying to explain their answers to each other during a peer math lesson. The possibilities are endless with these little magic boards. I would even keep them in my ideal classroom with an IWB, and 1:1 or even 1:2 computers! This entry was posted in Math, writing and tagged formative assessment, math, peers, prior knowledge, vocabulary, writing. Bookmark the permalink. They ARE priceless and shhhh, sometimes they do a better job w/ formative assessment than those “clicker” things….I LOVED them in my 5th grade class! Thanks for the comment Amy! 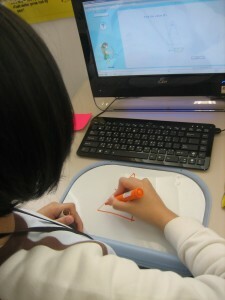 Glad to hear I am not the only one who knows the value of the mini white board, even in Grade 5! I agree, they are awesome. I use them all the time. 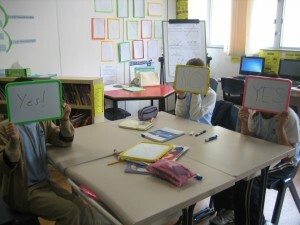 Great for all sorts of collaborative pair or group work. I love ’em for writing short stories, picture dictations, quick quizzes and as you say they are great for quick formative assessment. 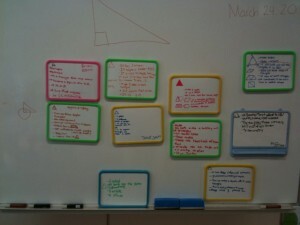 Thanks for posting – I needed reminding of how much I love my mini whiteboards! Great ideas for using the boards Tom! I just knew there were other teachers out there who felt the same way, thanks! Are your mini-boards magnetic? Or did you fix magnetic strips to them yourself? I was asking Resources Room for mini-boards but she said they were all signed out…The next best thing she had were mini-blackboards…Except there was no chalk. Oh well. I use them all the time. They also come in different sizes ! 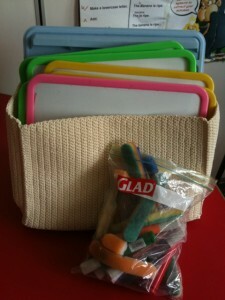 The younger kids love using them and it motivates them to engage in all types of learning activities.